Nothing is more evocative of the holiday season than an evergreen. 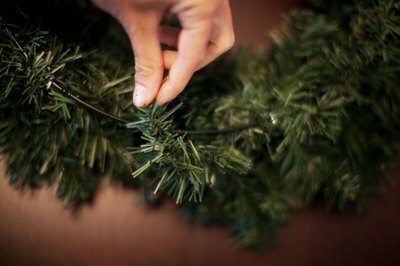 Making your own evergreen wreath is an easy project. 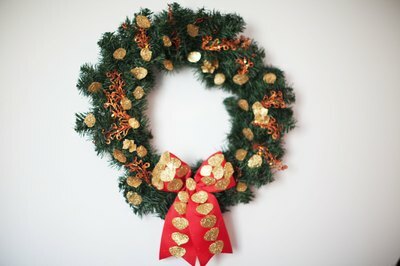 You can hang the wreath from a door or on a wall to add Christmas cheer to your home. Purchase a box wire wreath form or make your own. Shape two wire hangers into circles. Place one hanger on top of the other with the hooks aligned. Connect the hangers by twisting three pieces of floral wire at the three-, six- and nine-o'-clock positions. Wrap green floral tape around the hangers to cover the wire. Cut the evergreen branches into 10-inch-long lengths with garden clippers. 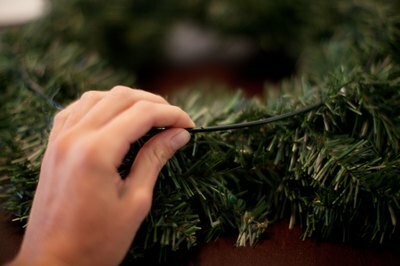 Place one branch near the top of the wreath and attach it to the frame with floral wire. Arrange another branch so that its needles overlap the stem of the preceding branch. Secure it with floral wire. Continue adding branches and tying them with floral wire until the frame is covered and the wreath is as full as you desire. 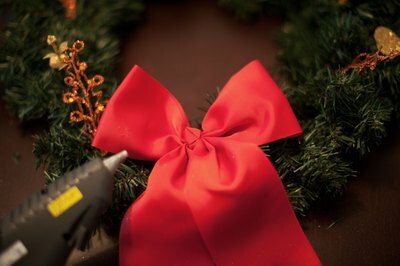 Hot-glue your choice of fillers around the wreath. Cut the velvet ribbon into a 3-foot-long strip. Tie the ribbon into a bow. Hot-glue the back of the bow to the wreath.